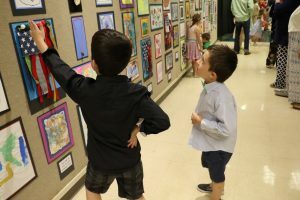 The gallery is packed with people perusing the walls, commenting on the vibrant colors, shapes, and textures, evaluating the artistic expressions. 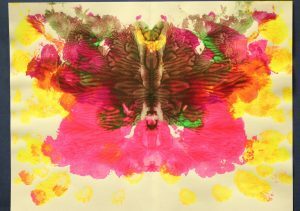 There are over 500 works of art at this show, all matted for heightened display. 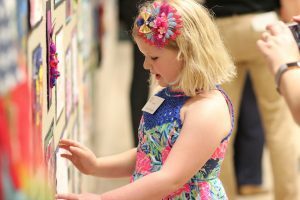 It might be the most popular gallery event in Lexington. 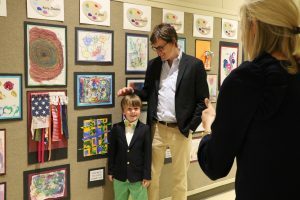 We know it is the most popular gallery event at The Lexington School. 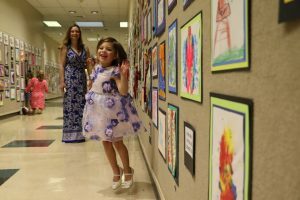 It is the Preschool Art Show, and it is a true celebration of child creativity. 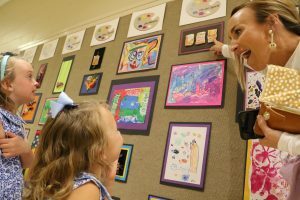 Founded by Donna Hutton, Preschool Director, the Preschool Art Show is a labor of love for the art department and copious parent volunteers. 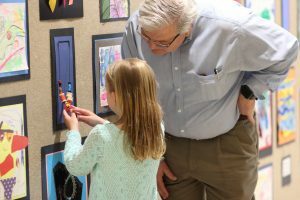 Lori Barnett, preschool art teacher, collects special works of art from each artist, four in total for ages 3-5 and two for Acorns, and keeps them in personal portfolios throughout the school year. 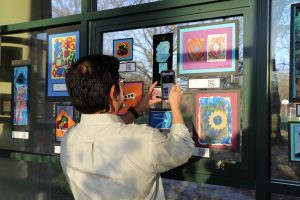 Starting in January, creative parent volunteers begin the framing (matting) process, and by April, the pieces are mounted on the walls of the fine arts wing in preparation for the big celebration. There’s more. 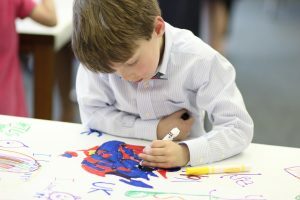 Preschool students are recorded explaining the process of creating one of his/her four pieces, and a QR code is added to that child’s artwork, so parents (collectors) can see and hear the child creative mind at work. 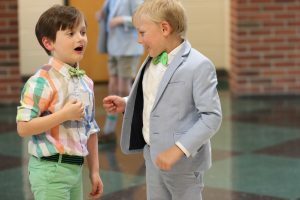 In preparation for the celebration, preschool boys paint their own bow ties, and girls make special pins to wear the night of the show. 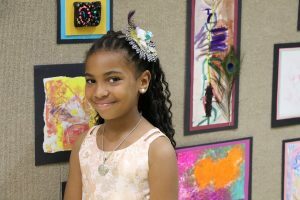 Attire is gallery chic! 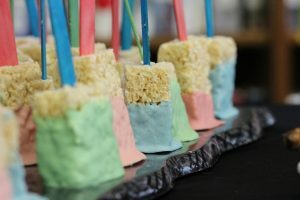 Chef Ryan and staff prepare the most creative of special snacks and desserts, and the decoration committee builds centers of actionable creativity for those attendees who feel the urge to dabble in the arts as well. Lori Barnett, preschool art teacher, explains the entire experience in this instructional video to parents (collectors). 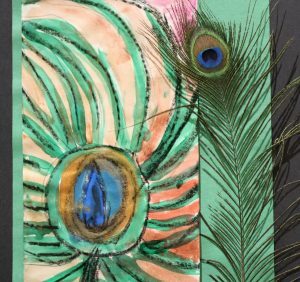 Nurturing creativity in children requires a passion and a commitment from the adults who teach them. 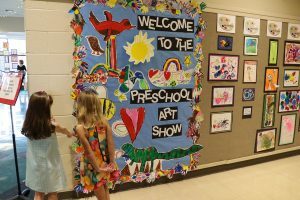 The Preschool Art Show is a big deal at The Lexington School. 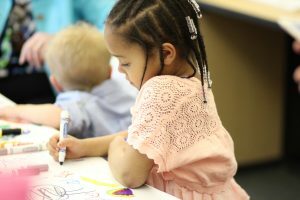 It’s a complete expression and culmination of the creativity inside all of, especially the children we teach. 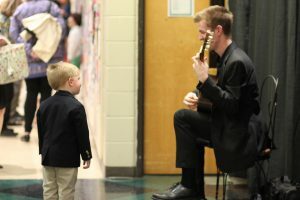 This event was awesome. 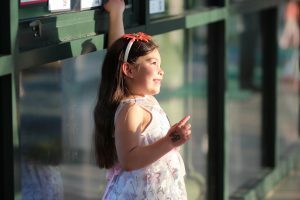 The displays were outstanding. 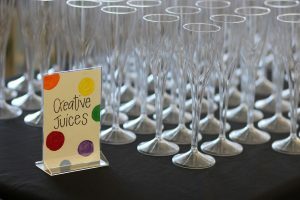 It was my second event and was even better than last year. 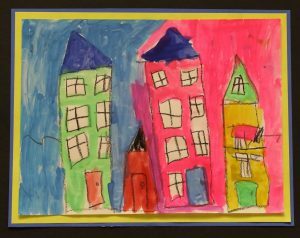 My grandson has definitely grown as an artist. A big thanks to all that worked so hard to prepare this event.